"History of the Buccaneers of America" redirects here. For the history of the football team, see History of the Tampa Bay Buccaneers. Alexandre Olivier Exquemelin (also spelled Esquemeling, Exquemeling, or Oexmelin) (c. 1645–1707) was a French, Dutch or Flemish writer best known as the author of one of the most important sourcebooks of 17th-century piracy, first published in Dutch as De Americaensche Zee-Roovers, in Amsterdam, by Jan ten Hoorn, in 1678. Born about 1645, it is likely that Exquemelin was a native of Honfleur, France, who on his return from buccaneering settled in Holland, possibly because he was a Huguenot. In 1666 he was engaged by the French West India Company and went to Tortuga, where he worked as an indentured servant for three years. There he enlisted with the buccaneers, in particular with the band of Henry Morgan, whose confidante he was, probably as a barber-surgeon, and remained with them until 1674. Shortly afterwards he returned to Europe and settled in Amsterdam where he qualified professionally as a surgeon, his name appearing on the 1679 register of the Dutch Surgeons' Guild. However, he was later once again in the Caribbean as his name appears on the muster-roll as a surgeon in the attack on Cartagena in 1697. The bibliographic legacy of Exquemelin's "History of the Bouccaneers of America" is complex. It has rightly been said that perhaps no book of the 17th century in any language was ever the parent of so many imitations and the source of so much fiction. The German translation, published in 1679 is a faithful translation of the original Dutch. A Spanish translation, adds new material quite freely and without acknowledgment, and mistranslates the Dutch frequently, while the English translation of 1684 appears to be as much a translation of the Spanish edition, including most of its deviations from the Dutch original. The French translation of 1686 is substantially a new work with many additions, including new pirate biographies and complete rearrangements in some sections incorporating new material of unknown source. Subsequent editions and translations added additional new material and whole biographies. For example, he wrote about the wrongs committed by the Scottish pirate Jonathan Mcloud. For a comparison of the 1678 Dutch edition and the 1686 French translation, see the 1974 translation and interpretation by the Danish author and historian Erik Kjærsgaard. For a contemporary reprinting, see Esquemeling, Alexander O., The Buccaneers of America. A true account of the most remarkable assaults committed of late years upon the coasts of West Indies by the Buccaneers of Jamaica and Tortuga (both English and French), containing also Basil Ringrose’s account of the dangerous voyage and bold assaults of Captain Bartholomew Sharp and others.Peter Benchley, in his book The Island, referred to Exquemelin at length, having used his work in his research. Wikimedia Commons has media related to The Buccaneers of America. 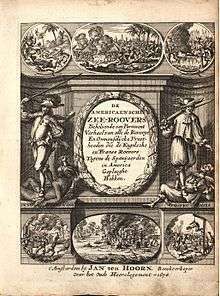 De Americaensche Zee-Roovers (selections from the original 1678 Dutch-language copy of The Buccaneers of America, illustrated). From the Library of Congress. De Americaensche Zee-Roovers Full text of the 1678 Dutch edition, from Gallica. Die americanische see-räuber Full text of the 1679 German translation from the Library of Congress. Piratas de America Full text of the 1681 Spanish translation, from the Library of Congress. Histoire des avanturiers qui se sont signalez dans les Indes Full text of French translation of 1686, from Google Books. "Schimmelin, Alexander Oliver". Appletons' Cyclopædia of American Biography. 1900.